not exactly in order, sorry. There was this terrible storm at rush hour, with tornado sirens and pouring rain and night-dark skies. lisa made it home ok without any lightning or tornadoes hitting her. i had made crepes for dinner and after it cleared up the sky was all these crazy colors. there was a HUGE rainbow and everything looked like it was lit by a giant lightbulb outside. 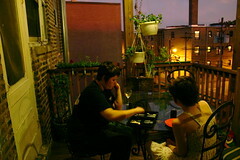 lisa and i enjoyed the garden and played backgammon on the deck after dinner. it was kinda perfect.